Atheism is growing in America and around the world. But is there a good reason for its popularity? Do they know something we don’t know — or do they just not want some supreme being or a “God” to tell them what to do and not to do? Is it reasonable to be an atheist? Which takes more faith: atheism or theism (belief in a God)? I gave a talk a while ago called “Atheism: What You and Your Kids Need to Know.” You can purchase the MP3 of this talk here. The talk was fun and hard-hitting. In a simple way I helped the audience understand the reasons and implications for atheism and theism. 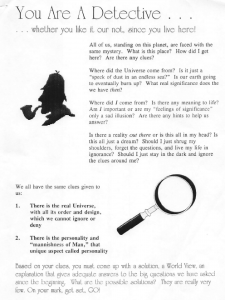 OK, you are the detective and you have clues. There are very few possible options so it is really quite easy. My 3-page chart below helps you work through the clues. Click image to see the whole 3-page chart below.